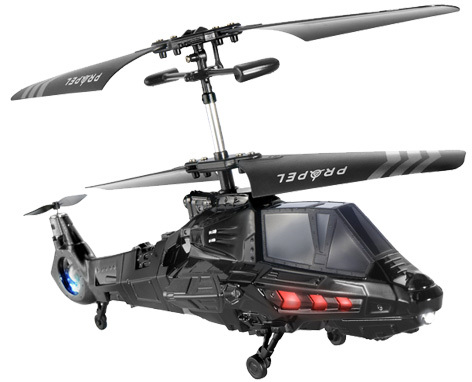 Popular American radio controlled toys supplier Propel is well known in that country for a fantastic range of innovative products at the cutting edge of the newest technology. Available in the UK for the very first time at the end of 2014, the Air Combat helicopters are one of the best examples of this ground breaking design. Propel has developed an amazing ‘motion controlled’ joystick on the hand controller that mimics the one used in real combat machines. By utilising the 2.4GHz radio spectrum, up to eight Air Combat helicopters can fly at once, each one battling it out for air supremacy! When a model is hit, the Flight Stick vibrates and flashing lights with exploding sounds indicate a direct hit. The Speed Star series of RC helicopters are also available for the serious enthusiast who likes to customise the model as well as changing flight characteristics. With a huge continuing investment in research and development, Propel are continually introducing new models and features to their ranges. The models are supported with great back-up in the form of spare parts and advice from experts who are familiar with all the products. RC Drones, robots and other vehicles are all in the product pipeline.